The sky is clear, the scope is out cooling down, but I'm not too hopeful of clear shots. I think it will be turbulent like last night. So why not pop over to Steve Massey's Mars page and have a look at some of his nice shots. There is some good images on the Ice in Space Solar System photography forum as well. as if through a glass, darkly. After days of rain, cloud and general horribleness, Opposition day dawned bright and clear. It was a beautiful, perfect day with those intense blue skies that you yhink are a dream. The kids even went swiming. Unbelievably, it held out until night time. The skies were dark, the air was cool and there was no breath of wind. I acclimatised my scope for two hours before attempting to observe. And the seeing was terrible. Desipte the stillness, and the fact that it was close to midnight, ging everything time to come to some sort of equilibrium, Mars roiled and boiled in turbluelence. The scope was dripping with condensation as well. Tom had similar problems as well. I tried both sketching as catching some images with the webcam. You can see the webcam result up above. The colours were magnificent though, and even through the toil and bubble there were flashes when you could see some detail. 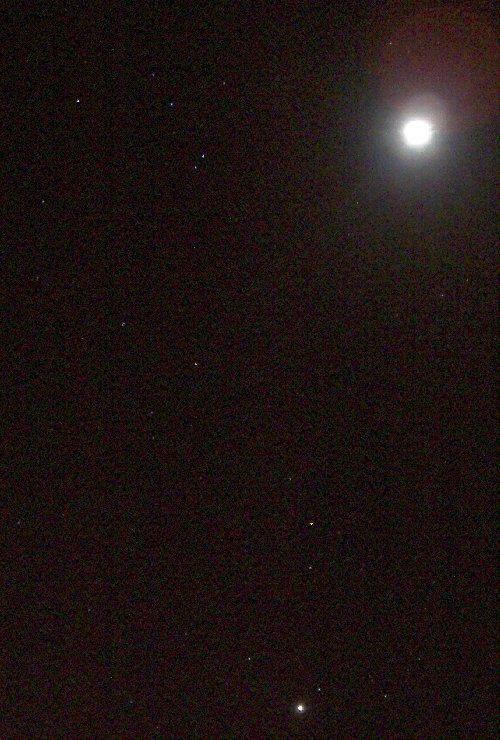 And it was the first time I have seen Mars in over three months. On the night of opposition of 2003 (and days before and after), I only got brief glimpses through rainclouds, so I am happy rather than dissapointed. And it is cloudy, and more cloudy weather forecast. So I won't be watching the amazing dust storms on Mars. So here is a picture of the ISS going past Venus taken way back on the 1st. This was taken with my Pentax KM on a tripod precariously perched on the side of a steepish hill while at Norton Summit. As always, click to enlarge. The colours are a bit strange as this is a scan of the negative, which got over exposed by the automatic scanning device. I probably went overboard on the exposure, it might have been a more dramatic picture with a shorter ISS trail and less trailed stars. But heck, it looks nice. Venus and ISS approaches are predicted by the folks who do the ISS solar transit predictions. As for Mars? Keep an eye on Ice-in-space for Australian images of Mars (only two old, but nice, ones there at the moment). See the NASA science site for some interesting details of all hallows eve, when Mars is almost closest. 5 Sleeps until Mars's Closest Approach! 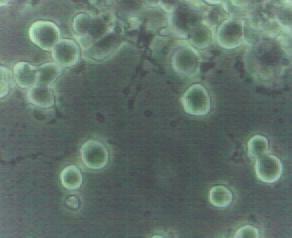 Rat Phaeochromocytoma cells imaged with a webcam and Steve Mogg's Microscopy adaptor through an Olympus inverted microscope. As you can see, my Mars observation program is going swimmingly. That is, immersed in large amounts of water. I have observed Mars once in a month and a half due to really horrible weather (which still hasn't given us enough rain to break the drought). The image is of the cells I use to model nerve function, and I must tell you more about them one day, but for now I'll just note that webcams make dandy microscopy systems just as they make dandy astroimaging systems (we have an Umpteen thousand dollar microscopy imager on level 4, but it can't image cells growing in petri dishes, which is what we need for our research). At least my webcam is getting an airing in the run up to Mars's closest approach to Earth. Mars as seen at 11:00 pm AEST on October 30, the date of closest approach to Earth. Image generated by the Solar System Simulator. Yes, on the Night of Sunday, October 30 Mars will make its closest approach to Earth. Mars's opposition is on November 7, but sometimes opposition and closest approach are at different times. Anyway, on October 30 Mars will be a pleasant 20 deg arc minutes in diameter, well visible in any amateur telescope. In the fortnight before and the fortnight after Mars will also be a respectable size, but there is something special about observing on the night of closest approach. In 2003 we watched the great Opposition out at Sandy Creek, or tried too. Of course soon as the scope came out it clouded over and started bucketing down. We finally got a peak at 4.00 in the morning, but it felt magical. Anyway, this time I'm staying home. 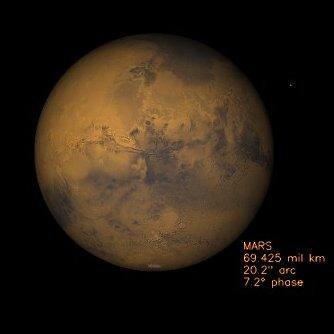 Mars is fairly easy to spot, it rises reasonably early and can be seen in the north-Eastern sky as a fiery orange object, by far the brightest object there (behind you Venus glows fervidly near the western horizon, the nights really are beautiful). For more details on locating Mars and sky maps, see my Mars Opposition page. No matter how small your scope, you should see something. The accompanying image is that of Mars at closest approach as shown by the Solar System Simulator. There will be a lots of detail to see on the night (as opposed to 2003, which had the most boring hemisphere facing us Aussies). 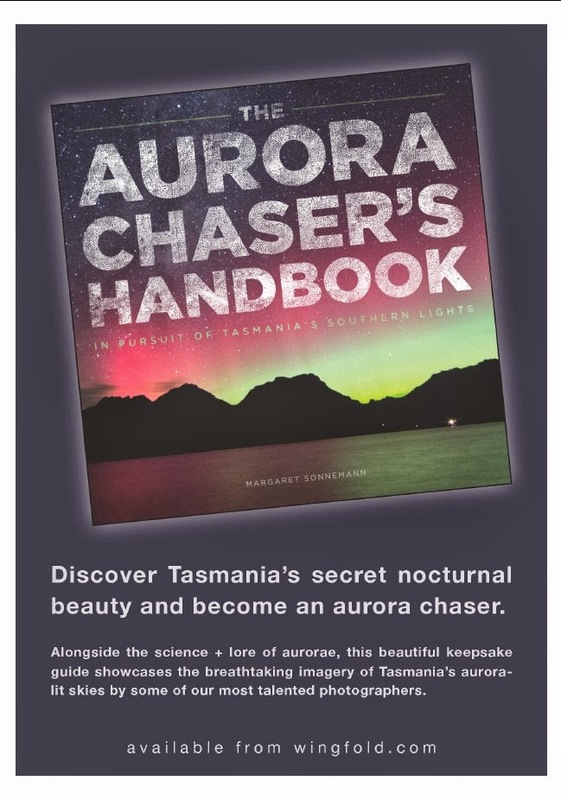 Even if you haven't got a telescope, pester a mate who has, or roll up to one of the planetarium or Astronomical Societies open nights which will occur around this time. That is, if there is something to see. Dust Storms on Mars. Image credit Efrain Morales. From the 18th of October dust storms have sprung up on Mars, making interesting viewing. However, if this keeps up then the entire surface will be shrouded in dust, as happened in 2001. I had missed observations for a few days, and I thought there was something wrong with my telescope until I found out about the storms. More images can be seen at the Marswatch page (WARNING, really big image heavy page). So we could be in for a vision of featureless disk. But we may see something fantastic. So over the next few night pop out and have a look at the red planet. And now I am off to bed. For the first time in ages it wasn't pelting with rain. The sky was clearing, and the Bettdeckererschnapender weisle, I and the kids walked down to the beach in the twilight. The boys splashed in the darkening water. Further out, two pelicans made darker silhouettes. A band of golden light hugged the horizon, with the darkling blue sky above. 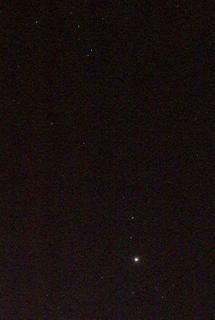 Venus gleamed up high, below it Antares and Mercury added to the evening spell. 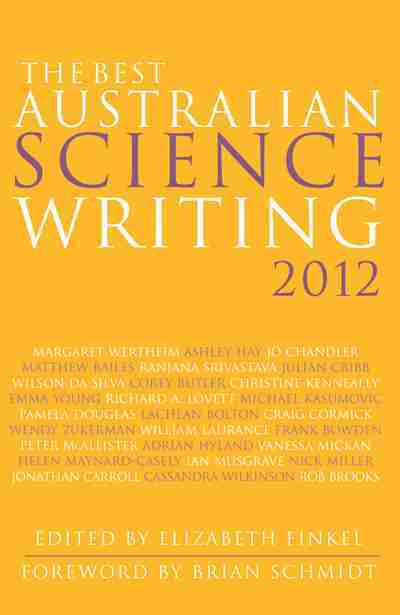 My postgraduate students have nominated me for Adelaide Universities Supervisor of The Year Award. I'm a little chuffed at this. Supervising postgraduate students is a delicate balancing act between letting them find their own way, and providing advice and direction to folks just starting out. I always feel I can do better, but at least my students don't think I'm a complete waste of space. The Australian ABC (our version of auntie Beeb) has just aired an episode on the vacuous Intelligent Design Creation movement on its science show Catalyst. Transcripts of the show are now available at the Catalyst website. I thought it was okay, a bit wimpy, but they were trying for journalistic balance I suppose (the presenter Paul Willis being a feisty creationist fighter from way back, I expected him to be a bit more hard hitting). I would have done things differently (but then again, I am not a science reporter, nor do I play one on TV). Firstly, they kept calling ID a theory. It is not a theory, it is not even a hypothesis, it is a layer of wishful thinking and mumbo-jumbo wrapped around a core of religion (they did expose ID's religious nature later on). Then, when the meaty bits came, they could have hit with some graphic demonstrations. At lot of the ID stuff requires technical knowledge and a good deal of detail to point out the fallacies, and is thus difficult to show on a TV program. But when they introduced Behe's mouse-trap analogy of Irreducible Complexity, they should have either introduced McDonald's reducible mouse traps or the Venus fly trap as clear, easy to understand counter examples. They could have hammered more on the testable nature of science, and on the fact that ID is constructed to be untestable. And that the ID folks are pitching ID to high schools before it has any runs on the board in actual science (not one original paper). (and it is). Also, the clear fundamentalist religious origins of intelligent design was revealed. And the infamous "Wedge Strategy", to use ID to replace Science with a (particularly American) conservative Christian ideology was made plain. As I said, I would have done some things differently (but then I wrote the chapter on the evolution of bacterial flagella in "Why Intelligent Design Fails". (No, I'm not going to sulk that Paul Willis didn't interview me, I think the got the technical level roughly right, I would have had too high a level of Geekdom). I would have used simple illustrations like the reducible mouse trap to show how their analogies failed, a diagram of a type III transport system next to a flagellum to show the reducible nature of the flagellum (they relied too much on the Discovery Institute Graphics). But showing the Wedge Document was brilliant, as was pointing out that all their material is distributed through conservative Christian ministries, not via science journals. Mike Archers comment that if you let ID into high school science, you had to let astrology in was apposite, as Behe has just admitted his definition of science would include astrology. As well, getting Behe to admit that he believes the Intelligent Designer is the Christian God automatically takes ID out of the sphere of science into theology. Behe comes across as an amiable buffer, but he is being hammered in the Dover Intelligent Design Trial at the moment. Do you think that Intelligent Design should be taught in science classrooms? The Moon at maximum eclipse. There is a reason for the blogs subtitle. After a mostly clear day, of course the clouds rolled in during the evening. At first it was patchy, and as I popped out to have a look in between kids homework, washing dishes and the other minuitae of life (like finalizing the exams and my Sky&Space contribution) the Moon was lighting up the clouds on one horizon, and Venus and Antares twinkled through gaps in the cloud on the other horizon. The night wa splesantly warm and the landscape silvered by the Moonlight leaking through the clouds. The ISS went over at 19:40. It was brighter than I expected, skimming through the patches of clear sky, it could even be seen dimly though the clouds in its path. The iridium flare coincided with a very cloudy period though, and could not be seen. 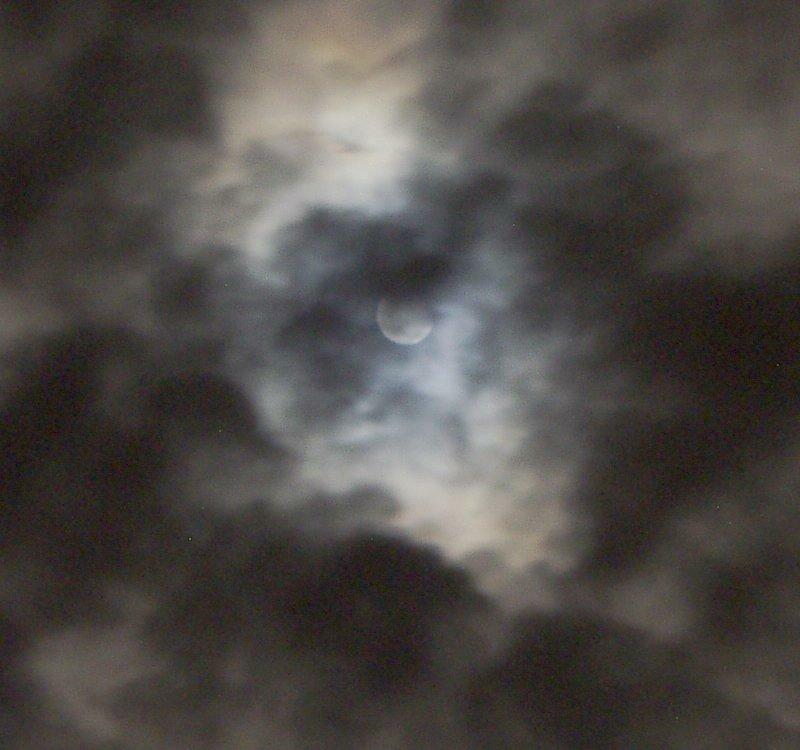 Then the clouds abated for a bit just before maximum eclipse, and I could see a definite "bite" from the Moon. Then the clouds rolled in again, obscuring the eclipse maximum. By the time the clouds cleared, the eclipse was pretty well over, but high thin clouds made a nice "Moonbow" around the Moon. All in all, despite the cloud and the loss of maximum, it was a beautiful night. Don't forget that tonight (October 17) there will be a partial Lunar eclipse. This will be visible from South East Asia, the Pacific, Australia and New Zealand. Not the best, as only the lunar south pole goes reasonably dark, but with Venus next to red Antares, and Mars rising on the horizon, it will be very beautiful, and well worth watching. Also, there will be an iridium flare, and an ISS pass in the lead up to maximum eclipse. Shenzou 6 might be visible from Eastern locations. Weather looks dodgy for Central Australia, and parts of the central eastern coast, but WA, Victoria, Tasmania and most of central QLD, NSW and some parts of SA should be clear. Local lunar mid-eclipse times will be the same for all east coast locations (22:03) , central locations (21:33), and western locations (20:32). Times of local twilight and the eclipse start can be found at the eclipse section of Southern Skywatch. You won't have to stay up late to watch this one. Yes, I've been somewhat slack with posts recently but A) I've been organising and assessing student seminars, and organizing our bianula colloquium, which has taken up large chunks of my spare time b) I've been desperately trying to get my submissions for next mioths Sky&Space finalized and C) My glases have been broken so I can barely see the computer screen to write. Anyway, here's something you might be interested in. The Chinese have launched their second manned spacecraft. Tom and Stuart have discussion of the the flight of the taikonauts (Chinese for astronauts) and Shenzou 6 here and here. While there is a news article from New Scientist here. I won't elaborte on this. But, if you want to see Shenzou 6 go overhead, head to Heavens-Above where there are predictions for Shenzou 6's visible passes over the next 5 days. Adelaide has only one decent pass, but the East coast has several. So go have a look. In order to see this, click on the image. For reasons I don't understand, images that are bright on my screen in paintshop are near invisible when loaded via blogger. 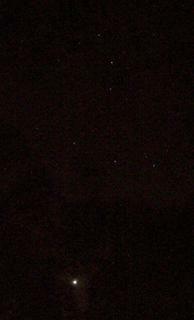 This shows Venus in Scorpius. 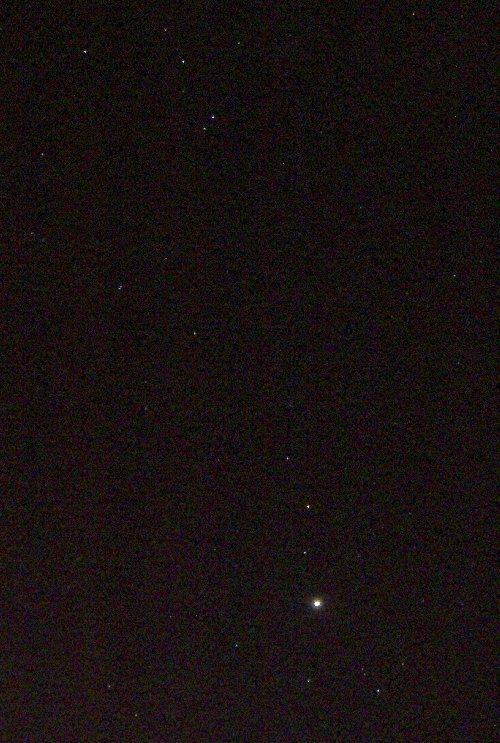 Well, due to lousy weather I missed Venus next to delta Scorpii. But tonight the sky was finally clear, and I got a reasonable shot of Venus in the Scorpion. Mrecury is also reasonably clear now (but had set by the time I had a chance to phtograph it). Venus will continue its climb through the Scorpion and on Monday October 17 Venus will be next to Antares. Quite a sight, also, that is the night of the partial Lunar eclipse. 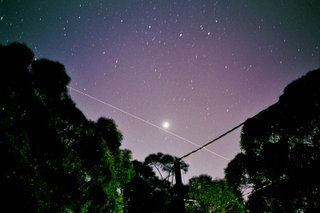 With an ISS pass, an iridium flare and a Shenzou 6 pass, Monday will be a night of astronomical fun. Venus near delta Scorii, with the waxing Moon nearby. Click to enlarge (so you can seee anything at all). Tonight (Monday 10 October) Venus will be a scant 36 minute of arc from delta Scorpii, giving the Scorpion a blazing central eye. Not to be missed if you have clear skies. Over the next few days Venus traverses the body of the Scorpion, and by Monday October 17 it will be beside bright Antares. On that night there is a partial Lunar eclipse too, so that night will be particularly beautiful. Well, I didn't get to see any of the Mercury-Jupiter conjunction due to cloud and now rain will probably stop me seeing the Venus-Moon display tonight. I was going to post some of my satellite images from the astest camping tip, but the powerpack for my flat bed scanner blew up, and I haven't been able to find a replacement. Lets hope the skies are clear for the October 17 partial lunar eclipse. 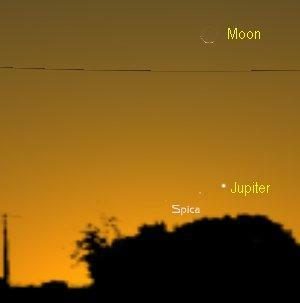 Over the next few days, Spica, Mercury, Jupiter and the moon will be in close proximity. The bad news is that they will be very close to the horizon, around 5 degrees (just under one handspan) at civil twilight (18:25 AEST, 18:45 ACST, 18:45 AWST) when the planets will be visible, so you will need a level, unobstructed western horizon to see this event. This afternoon I went out to have a look, Mercury was not visible, and Jupiter barely cleared the housetops. I'll have to go down the beach to see this. Tuesday, 4 Oct Spica, Mercury and Jupiter form a shallow triangle with the one-day old crescent Moon just below them. Wednesday, 5 Oct Spica, Mercury and Jupiter form a straight line with the two-day old crescent Moon above them. Thursday, 6 Oct Spica, Mercury and Jupiter form a narrow triangle, with Mercury above Jupiter. Venus shines below the head of the scorpion, as usual, click to enlarge the image. Okay, I'm back from swanning around in the scrub around Nortons Summit. One disadvantage to going bush is that, well, there is bush. You get relatively dark skies (Norton Summit is only one hour from the city centre), but all these trees get in the way. 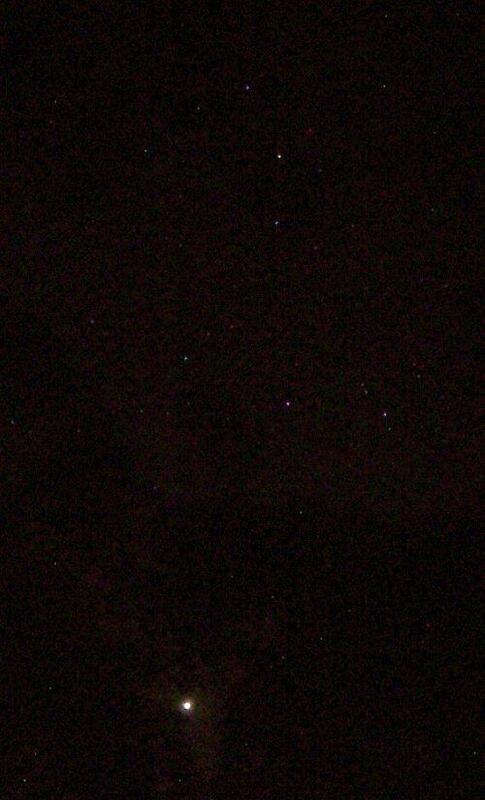 I got the above image on my Olympus mju:300 digital in between a gap in the trees, as seen from our verandah. I shot off an entire roll of film on my Pentax KM, got the ISS passing Venus, an Irridium flare and some more shots of Venus and Scorpio. Now I have to wait for them to develop to see what they look like. Of course my first priorities are to finalize Octobers' Skywatch and get my final articles in for November/December Sky&Space, so things may not be too exciting except for the Mercury-Jupiter conjunction.